Sicinius: What is the city, but the people. READERS MAY NOT GET DISCOMFITURED NOR DISCOMBOBULATED over the use of words that do not sound modern. OR words that people call 'archaic', when we are in our elements, we freely write, we get euphoric and ecstatic. We then choose to read King James Version (KJV) of the Bible, hence words like 'verily, verily', 'thou'; 'thee'; 'ye'; 'and it came to pass' are some of those we chewed, poured and passed our O and A Levels so many moons ago. Remember 'the egg of Colombus' story? The 'uovo di Colombo'. That is, a brilliant idea or discovery may seem simple or easy after the fact. The apocryphal story refers to the challenge to Colombus's feat of discovering America as something inevitable. Girolamo Benzoni wrote in “History of the New World” (1565). “… Mr. Christopher, even if you had not found the Indies, we should not have been devoid of a man who would have attempted the same that you did, here in our own country of Spain, as it is full of great men clever in cosmography and literature”. Colombus remained calm; then called for an egg and laid a wager: “… make this egg stand up” without spilling anything from the inside of it. All the men at the table tried without success. Colombus took it and tapped the end of the egg: it could stand! So, every person could have done it but who did it first? Obviously, carrying the celebration out of Accra must have been the icing on the cake, topping the celebration of the coronation of the Ya-Na Abukari at Yendi, the besieged capital of Dagbon, then. How best could the goodwill of the people have been rewarded? A good turn deserves another, they say. Or to quote William Camden in 'Remaines Concerning Britaine': “One good turne asketh another”. And Dagbon had given the nation a wonderful present by deciding to lay down their arms and brokering peace. It was a wonderful occasion, watching the event live on Television. Very colourful; the traditional dancers, their elegant costumes; kente and fugu. There was a good mixture of Ghanaian culture – Dagbon culture (the hosts), Asante/Akan culture, Ewe culture, Ga culture, the military displays, et cetera. 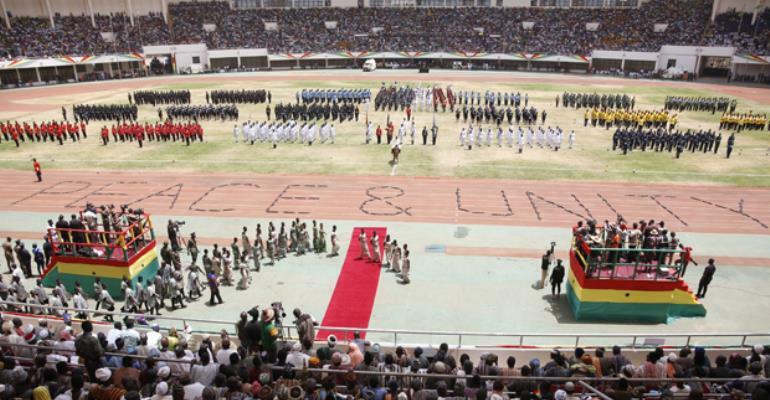 The venue for the occasion was the Alhaji Aliu Mahama Stadium, the Vice-President under J. A. Kufour. He had left Ghana 'prematurely', that calm personality from the northern part of Ghana. The presence of Mahamadou Issoufou, the Nigerienne President was very remarkable for Ghana-Niger relations. Zambramas had lived in Ghana, and contributed to her growth over the years. The President's speech was very reconciliatory. Dr. Kwame Nkrumah had uttered the memorable words: 'Ghana, your beloved country is free forever.' J. J. Rawlings and John Mahama had graced the occasion. They had once held the mantle of leadership of the nation. On the floor of Parliament, Honourable Alhaji Inusah Fuseini, NDC MP for Tamale Central was all too enthusiastic over the celebration of the day in Tamale. According to him, there was an added advantage to strengthen the unity between the Abudu and Andani royal families. Honourable Inusah Fuseini was contributing to a statement by Michael Yaw Jato, MP for Krachi East and Deputy Minister of Sanitation and Water Resources. The Speaker of Parliament, Professor Mike Oquaye urged the Members of Parliament to educate the society, particularly the youth, on the processes that led to Ghana's independence. Of course, the President had given a hint about the rotation in his speech at Tamale when he remarked that, “The success of the Tamale experience may, however, set the trend for the rotation of this ceremony.” And, again, one would read from Ghana Web the huge expenditure on “… Ghana @ 62 event held in Tamale… proper and one to behold… But underneath that pomp and pageantry lies what would wrench the hearts of many taxpaying citizens who struggle day and night to make ends meet… a whopping $3 million (equivalent of GH¢16,500,000) budget earmarked and actually approved for the Tamale event. We wonder why it is now that anybody would look closely at the cost of the celebration of independence. Or perhaps that is only the beginning? Or if it is Accra, there is no need to bother about the expenditure? The celebration of the 62nd Independence Day in Tamale did not stop the celebration in the regional and district capitals. Even our foreign embassies were not left out. In the days of the Roman Empire, it was the literally true that “all roads lead to Rome” because all the roads and arteries radiated from Rome. For our part of the world, at least for now, all roads lead to Tamale; literally and figuratively. This author has authored 95 publications on Modern Ghana. Destooling Chiefs: Do Ghanaian Presidents Have The Power?